Count down to "The Feast of the Seven Fish" continues. Last week I made two fish: tuna and shrimp. 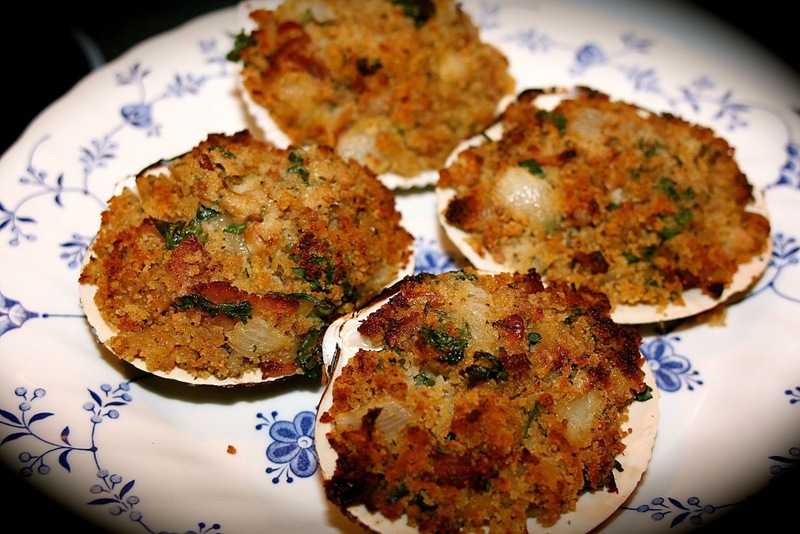 This week is a favorite classic Italian American appetizer stuffed clams. This is a great recipe to make for non-fish lovers. The clams are well disguised in the bread crumbs, and the flavor of bacon makes anything palatable. I'm not kidding you: EVERYONE LOVES STUFFED CLAMS. This recipe can be made with canned or fresh clams. Fresh clams do taste better, but canned are more affordable and easier to find in most grocery stores. Now the shells for the stuffed clams are harder to come by... if you are getting the clams fresh ask your fishmonger for a dozen shells. You can also buy them at a craft store. Just wash them. Even after cooking the stuffed clams in the shells, wash them in the dishwasher and reuse them... if your kids don't get to them first to make crafts. If you can't find shells ramekin dishes work fine. 1) Put oven rack in the middle and turn on broiler. 2) Sauté bacon and onions together in a medium size skillet until both are lightly browned. 3) Add parsley, bread crumbs, clams, and a little at a time of the clam juice to the bacon and onions heat through. You want to make the mixture moist with the clam juice but you don't want it to be soaked. You probably will not need to add the whole cup of juice. Remember moist, not soggy. 4) Shake a dash of Tabasco sauce and lemon into the mixture, stir. 5) Use a large serving spoon to stuff clam shells or ramekins. Pack tightly. 6) Place stuffed shells on a large baking sheet and put a dot of butter on each stuffed clam. 7) Broil until lightly brown, approximately 5 minutes, check constantly. I have always loved this soup at Indian restaurants. 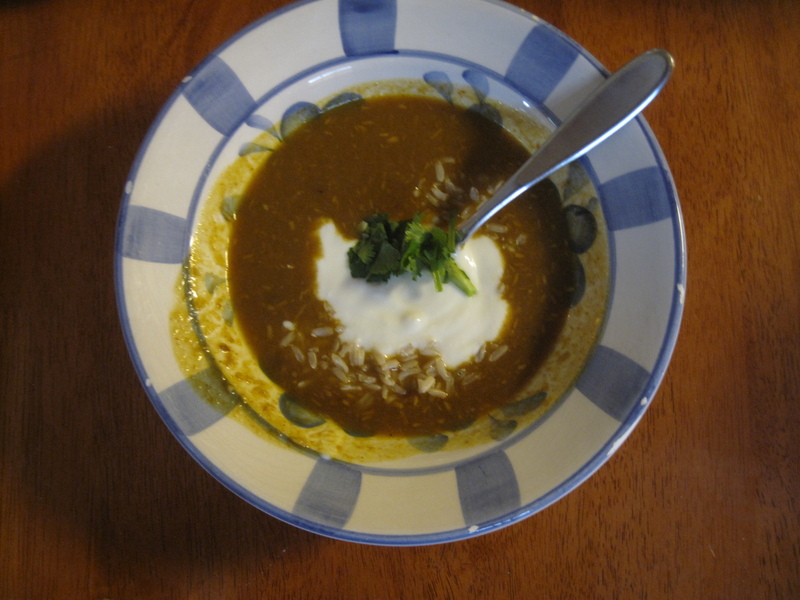 There is a wonderfully warming balance of flavors in this soup. Great for when it is chilly outside. Both the dressing and this salad are worthy of praise. Poppy sesame dressing over greens covered in cranberries and candied nuts plus other delicious toppings is both healthy and delicious. These stuff peppers remind me of how my Italian grandmother would make them: stuffed with bread, Parmesan, pine nuts and raisins... so wonderful. I have eaten these cookies before and they burst with lemon. They are truly zesty. I also recommend you check out Roz's blog if you are interested in Italian culture. Gorgeous pictures and narrative. Thanks so much for bringing this by... my family has a cold right now. Thanks for the party and hope you are having a wonderful week! Those clams look delicious. Thanks for hosting. I brought a winter salad with roasted squash & potatoes over arugula with feta & pomegranate seeds - very festive. Thanks Sam I loved that salad when I was looking at it on your site. I have never had stuffed clams before, but they look delicious! Thank you for the party, Diane ... Have a great weekend. Please try them Jamie... they really are yummy. My "Honey Bunny" would think he is in heaven with your Stuffed Clams, I will have to make them for him. Hope you are having a great week and thanks for hosting! I hope he enjoys them. Thanks for stopping by. Diane-the bread crumb topping looks incredible! Beautiful dish. Thank you for another round of Foodie Friday. It is very yummy and so simple to make. Thanks so much for hosting Diane! Have a great weekend! Thank you Diane for hosting. Have a great weekend! Thank you for the invite Diane! I've added my Brown Butter Apple Tart - I must confess, I almost ate the whole thing! Have a great weekend! I think the bacon would easily get my husband to try a fish dish! These look amazing! Bacon and butter make everything better! I am not a fan of clams (or any shellfish, for that matter- in fact, I think I am allergic), but those look really good. Thanks for the link-up. Hi Diane, Just came from Foodtastic Friday. We always make baked clams for Christmas Eve, though we never used bacon. It sounds delicious. I've pinned this and following you. Hope you have a chance to stop by. It is definitely not traditional to add bacon, but we like the taste. 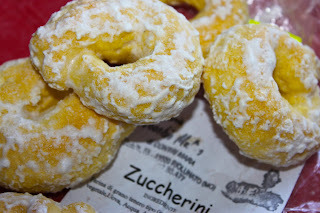 Thank you so much, Diane, for the kindness of featuring my zuccherini cookies on Foodie Friday!! I am very honored! I have proudly displayed the badge on both my post and on my sidebar. Thank you again!!!! You are very welcome. So wonderful to have you here. Thank you for the invitation, Diane! This is a great Foodie Friday party - so many wonderful recipes! Thank you for hosting. I wish my family liked more seafood! Your clams look amazing and I need an excuse to make them! It is really weird to me how few Americans like fish esp, seafood? I don't think we eat it enough and a lot of places it's just so hard to get. PS...I linked up, but my blog is changing to WP this weekend, so I've added your link, but I need to do it tomorrow on my new site, too. Just wanted you to know in case I can't figure it out! These look great! Thanks for sharing at Must Try Monday! Thank you very much. I joined your site and submitted this recipe. Wonderful resource you have. Your Bacon Stuffed Clams is making my mouth water. I would love to feature your blog on Home Cooking this Wendnesday. I hope you get a chance to stop by to snag my button. Thank you very much, I added your button to my site. These sound so good. Great for appetizers at a Christmas party. Thank you for sharing.I didn't know that you could buy clam shells at a craft store. One of my favorite things that I make during the holidays and summer months when clams are a plenty. This looks SOOOO good! Ohmygosh - can you bring me a plate? I've featured it on the Mrs - so come on over & check it out when you get a moment! Your clams look delicious. Thanks so much for sharing at Wednesday's Adorned From Above Blog Hop.